Ten years ago, when I was working on Robots at Blue Sky Studios, animation boss and all-round Fox Studio supremo Chris Melandandri let us animators in on a secret - a new wave of indie animated features would soon be coming our way. Animation would, he predicted, not for long remain the sole preserve of well-financed animation studios. Soon we would see the rise of the independents - small, nimble production houses with great scripts and great ideas that would muscle in on the market. Ten years later, Chris's prediction has come true - indie animated features are all around us. In fact, he led from the front by leaving Fox and founding Illumination Entertainment, joining forces with studio MacGuff in Paris to create the super-successful Despicable Me. Animation is getting cheaper and faster, and even micro-studios are getting in on the act. Tiny animation houses can now do quick, cheap and effective animation for small clients that could never afford to pay for traditional animation, with all its painstaking processes and heavy production costs. A few days ago an old friend of mine (and a top animator) posted at Facebook about the absurdity of a client asking for him to make an animated film "for a few hundred dollars". How ridiculous! But I wondered - why is it so absurd? What if we could do animation for such a small amount of money - surely there would be a huge demand for this kind of work? In fact, there are tiny studios springing up doing exactly that - creating animation for a tiny, super-low price. www.peopleperhour.com will make you an animated film for your company for £25 - that's around $40. OK, its not Disney or Pixar, but it's a semi-bespoke product that can give every plumber or bricklayer their own company animated logo for the price of, well, lunch. Fifteen years ago it seemed an absurd idea that every little company in the world would need their own website - but now it is commonplace. 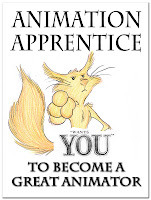 One day, every company will have its own animated logo - spawning a huge amount of work for tiny animation studios (think talented graduate with a laptop) that can nimbly provide animation for a very low price. And, for £25, maybe I'll get them to do one for me.